For healthcare and educational professionals seeking a fixed placement privacy solution that can easily be drawn to protect patient privacy or quickly swung out of the way for unobstructed viewing and patient access. 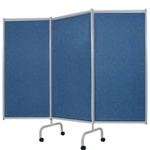 The Privess Swing-Away privacy screen is a wall mounted, telescoping privacy screen. Also available in standard white vinyl. Stores completely out of the way, yet provides a wall of privacy on demand. Will not interfere with patient lifts or other equipment. Sure-check vinyl is strong, durable, antimicrobial, anti-static, flame resistant, stain, odor, and fluid resistant. Most oils, greases, and contaminants may be wiped off with soap, water or mild cleansers. Curtains are easily cleaned in place and maintain a fresh look. Controlled release system continually sends the antimicrobial agent to the fabric surface. This built-in protection lasts the life of the fabric and is far superior to topical treatments. 1-year warranty against manufacturer defects. Finding the exact medical supplies you need for yourself or your patients can feel like a wild goose chase. Fortunately, you've found a great place for all yourneeds, including Winco Privess Swing-Away Privacy Screen With Sure-Chek Vinyl. Medical Device Depot is the premier source that will be the most responsive to your needs and the most beneficial to your company. Our professional service agents can also answer any questions and address any concerns you may have so you can order exactly what you need, hassle-free. We process your order and ship our products out as fast as possible, with expedited shipping also available for an additional cost. Sales tax will be charged on any orders shipping to the state of Maryland only. All other orders will be tax-free. Medical Device Depot offers financing options via LeaseStation for all credit types and new and established businesses. Our site offers the highest level of security and encryption, backed by Volusion Secure Site SSL and Norton Secured by Verisign, so you can shop worry-free.